Dogs wearing boots for the first time: I love them. There is something about the way dogs walk when they have foreign objects strapped to their feet—as if they’ve forgotten how their limbs work—that cracks me up. Every. Single. Time. When I had to get boots for my dog this winter, outwardly I grumbled—who wants to deal with putting boots on a dog every day?— but inwardly, I was excited—now my dog could look just as silly as all those pets in the videos. Yes. Bucket List just got a little shorter. 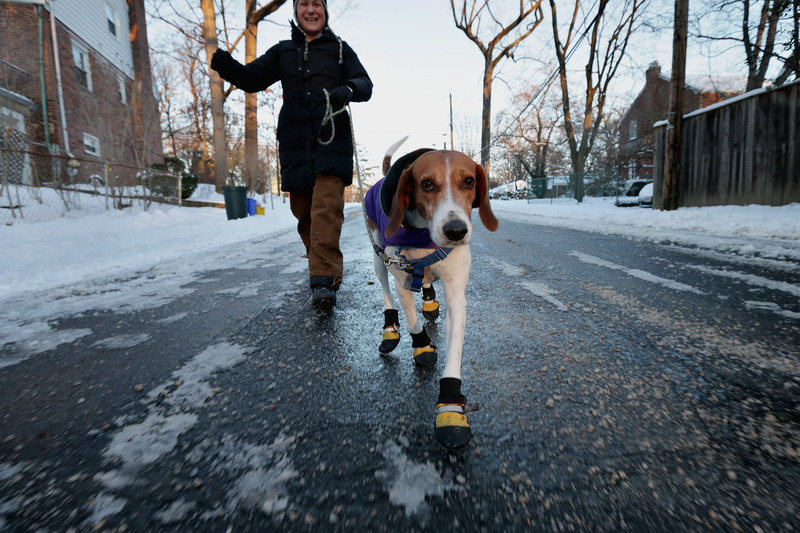 People who get boots for their dogs aren’t just torturing their pets to get a laugh. There are lots of completely legit reasons for putting boots on your dog, including allergies and other skin sensitivities, as well as extreme temperatures during summer and winter. In my pup’s case, boots are a winter necessity; during the cold months in the northeastern city where I live, the sidewalks are regularly coated with salt, gravel, and some menacing looking green chemical I can’t identify. The salt and ice can get in between her toes and cause pain, and I don’t want her licking the green stuff (whatever it is) off her paws. It’s just an added bonus that she happens to look totally ridiculous in them. Here are, for your viewing pleasure, twelve videos of dogs trying to walk in boots for the first time. Hit it, pups! Here’s Boston Terrier, Mr. Magoo, looking goofy in his powder blue booties. Come on, girl. You can do it! Winnie the Tzu has her very own YouTube channel. If UGGs made dog boots, they would be these boots. Look at that stubby little tail wagging! She looks like she’s possessed. By cuteness. Another pup with the blue boots—apparently powder blue is in this season? A whole compilation! Just look at all these silly pups!